Gasoline: The trip is a thousand miles one way and our minivan gets approximately 21 miles per gallon. We will drive another 200 miles during the four day visit and then another 1,000 miles to get home. Total fuel cost: $280. Food: We pack lots of snacks and try to keep food costs low as we travel. We always have a cooler and drink plenty of water. Even so, on a fifteen hour journey with three kids, food must be purchased. We will spend around $60 on food. Lodging: We have not yet driven the entire 1,000 mile trip straight through. We are discussing the possibility of doing just that this Sunday, however, if we stop to stay the night in a hotel on the way home as we did on the way here, our lodging costs will be around $160 for the entire trip. So, as far as direct costs go, the final total cost for this trip to see family and friends will be around $500. However, there are some indirect costs such as missed employment and the $1,200 car repair bill that we incurred two weeks ago while getting the van checked out in preparation for this trip. There may be some who think that the time, distance, cost and risk associated with a trip of this length is not warranted by the need to see family – there will be a point this weekend while speeding along on some interstate where I may agree with you – but the fact is that Mrs. Stew and I place a high priority on family relationships. We are willing cut our cable, eat bag lunches, rent a small apartment, conserve energy, grow our own food all in an effort to reduce expenses, but there are some things that we are committed to, no matter what the cost. I know too many families who do not spend time together, nay, cannot spend time together. God has ordained that I am a member of an extended family that enjoys being together. The laughs, the memories, the old photographs, the hugs, the grandchildren holding grandpa’s hand are some of the true joys that this life holds. They are too important to miss on account of 500 bucks. And a month from now, we will drive twelve hours the other direction . . . Happy Holidays! Vacations are expensive, should we go or stay? I’m glad your family is worth $500 to see! Some people don’t have the kind of relationship with their families, and that’s sad. My husband and I are debating whether we should try to move closer to family in the near future (they are 8 hours away right now). I think as everyone ages, it would be easier on everyone if we lived closer. It would be a hassle now to find a new job and pick up and move, but at least we’re renters right now. Ok — and please don’t take this the wrong way, but if those are your kiddos in that pic (cuties!) please be sure your son is properly fastened into his booster seat when the car is moving. I don’t know if that pic was taken while driving or whatnot, but his shoulder harness should be tighter across his shoulders — not falling down his arm. He’s gotta be in properly (even if asleep) so that the harness can work properly if it needs to. Thanks, Stacy. 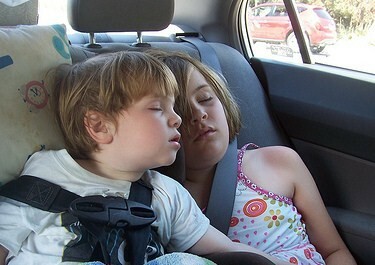 Those aren’t my kids, ours are safely buckled in. :) we have talked about moving closer … But to which family? I think it’s great that you are doing the trip. I agree that family is important and if you have to make an effort to get together then you should do it. Personally I wouldn’t try for the 1000 miles in one day to save money. That is just too long/ too hard and not worth it to save $100 or so. Ha! Sorry, I meant “Kacie” in the above comment. 4P, we ended up booking a hotel. I think we could make the whole trip in a pinch, but we have a little leeway and decided to stop. Whichever one would cost more to fly to if you moved closer to the other family? Also, if you’re living in the middle and visiting each family once a year, you have to double your travel costs and compare that versus a couple of plane tickets a year to visit the non-local family.